Many of you will have seen the amazing story of Darek Fidyka, the Polish man now walking again with a frame after being paralysed in a knife attack in 2010. The words “medical breakthrough” are perhaps overused but the reconstruction of nerve tissues enabling paralysed people to walk certainly warrants them. What we don’t always see is how the breakthroughs were funded and I wanted to share the examples of the two charities involved in this amazing story by way of an example on how to make the most of success stories. The two charities are UK Stem Cell Foundation (UKSCF) and Nicholls Spinal Injury Foundation (nsif). The medical breakthrough has appeared across numerous national media and broadcast channels (including a BBC Panorama programme) but the two charities appear to have taken a different approach to capitalising on it to drive further support for their work and this I think is of key importance when an issue drives so much positive coverage. nsif have reworked their website to directly incorporate the scientists, the story and their involvement in this breakthrough. The slider at the top of the page tells a story that links directly to a fundraising ask, leaving users in little doubt about what outcomes their money would support. The rest of the page is very ‘mobile app’ in design and tells the simple story of the charity’s aspiration to help people walk again, linked to this breakthrough – described as having taken the first step – and asks for donations to continue the work. UKSCF seems to ha ve taken a different approach. Their website homepage is simple, easy to navigate and has a contemporary design but doesn’t even mention the story and highlights one of the key scientists only as a regular feature on the broader research team. The twitter stream has a few mentions and retweets but the Facebook page has not been updated and you wouldn’t really know that UKSCF has been involved in this truly groundbreaking work. or it might just be that the two charities decided that it would be nsif that lead with communications and promotions – all fair enough but this is a belting opportunity! 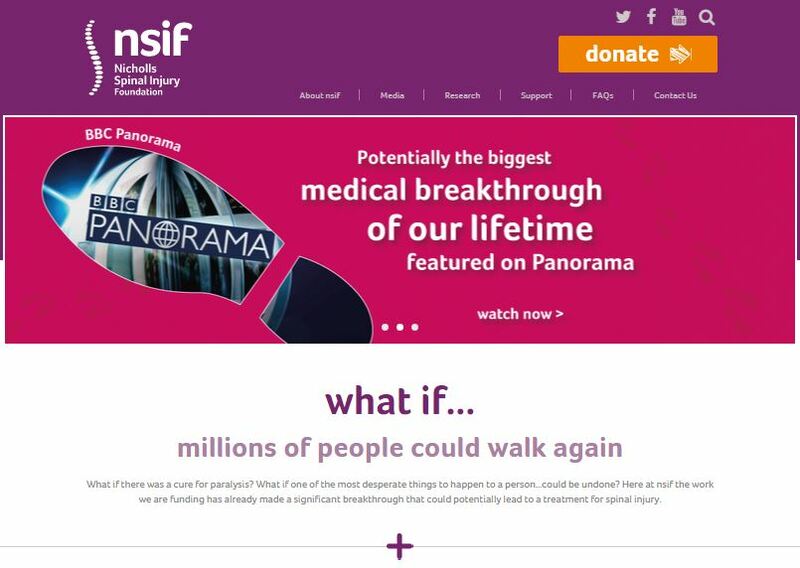 Consequently, I’m not criticising either charity but nsif’s approach, whilst undoubtedly taking more time and resources to plan and deliver, is well articulated, totally joined up and links fundraising directly to the long-term aspirations and immediate outcomes the charity is delivering. In my experience, opportunities like a Panorama programme don’t come along very often and thinking across internal comms/fundraising silos and working on how to grow both the awareness of what your charity does linked to the funds needed to make it happen is vital to success. In fact, even without the documentary, the story of successfully transplanting olfactory cells to repair spinal nerves is plenty amazing enough to generate interest from new and existing supporters. What would you be doing? And what are you doing at your charity to link your outcomes directly to generating support? The crucial thing that nsif did here was LINK their marketing with the outside world. Donors will be able to engage with and understand what nsif do. They’ll also take more time to hear their message. I know which promotions campaign I prefer.